The collecting of Olive Ridley sea turtle’s eggs and killing of adult females on nesting beaches led to dramatic declines in the population. In 1975, the National Marine Fisheries Service (NMFS) proposed listing the Olive Ridley sea turtle as threatened under the Endangered Species Act (ESA). In 1978, NMFS and the US Fish and Wildlife Service listed the Mexico breeding populations of Olive Ridley sea turtles as endangered under the ESA and the other populations as threatened. In 1996, NMFS published a status review for all sea turtles listed under the ESA and in 2007 completed a 5-year review for the Olive Ridley sea turtle. Another status review was initiated in 2012. 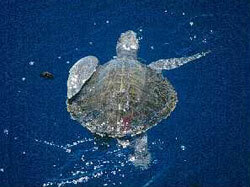 For general information on Olive Ridley Sea Turtle, see the Olive Ridley Sea Turtle species profile page.